Looking to replace your current water heater with one that is more energy efficient and one that will bring you hot water when you need it? Then we have the answer for you, the Geyser Water Heater is a very high efficiency heat pump water heater that will work in conjunction with your existing gas, oil or electric water heater tank. 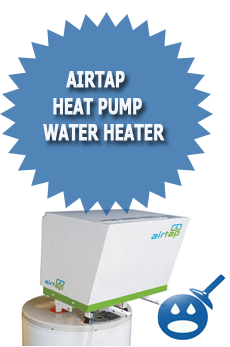 This heat pump water heater is designed for commercial and residential applications. What makes Geyser Heat Pump Water Heater different than the others is that Geyser makes the most of a renewable energy source, which is the ambient air, and humidity that can be found in garages, basements or even utility room. Did you know that your water heater is the second largest consumer of energy in your home next to the heating and cooling applications? A typical family will spend an upwards of $ 600 a year to heat your water? Standard water heaters that claim to be energy efficient are only about 60% to 95% energy efficient but Geyer Heat Pump Water Heater is 400% energy efficient. To show you how energy efficient this water heater is, say your water heater puts out 1 kilowatt or BTU of energy to run the water heater. The Geyser Water Heater will use 1 kilowatt and put out 4 kilowatts of energy. Some of the features of the Geyser Heat Pump Water Heater is that it has a smaller carbon footprint than a typical Solar Water Heating Unit. As we mentioned the Geyser Water Pump utilizes 400% of high energy efficiency. This heat pump water heater can save a homeowner or a business owner about 50% to 75% on energy savings over what a standard water heater will cost you. The unit has a 100% fail safe design that provides hot water when you want it and when you need it. The Geyser Heat Pump Water Heater works on 6,000 BTU’s per hour and 115 volts /60 Hz operation. The water heater uses the environmentally friendly R401-A refrigerant. The unit has an adjustable 90 degree Fahrenheit to 140 degrees Fahrenheit. The recovery rate on the Geyser Heat Pump Water Heater is 14 gallons per hour at 120 degrees Fahrenheit tank temperature with 60 degrees Fahrenheit water supply. The Geyser Heat Pump Water Heater has a durable powder coated steel cabinet that offers many years of no maintenance and high efficiency. These water heaters are compact, measuring at 16″ width x 15″ height x 20″ in depth. It has a built in circulation pump that has an easy to set up Whole House Instant Water Heater. No matter which way you vent the water heater; they meet and exceed all local and national codes. As we mentioned this heat pump water heater offers effective and efficient energy with a rating of an impressive 3.0. This makes the Heat Pump Water Heater from Geyser to be qualified for Energy Star rating. With the Energy Star rating of 3.0 energy factor this energy star rated water heater qualifies for local and state rebates and tax credits too. If you are not sure what rebates and tax credits that you would be qualified for when you purchase a Geyser Heat Pump Water Heater, you could log onto the Geyser Heat Pump website, then click on the Database of State Incentives for Renewable and Efficiency and click on the state where you live and check out all of the state rebates and tax credits. How Does The Geyser Heat Pump Water Heater Work? Once you take off the cover of the Geyser Heat Pump Water Heater you can take a look inside and see the internal components of a small geothermal unit. This unit has an evaporated coil and water to refrigerant exchanger. It has an expansion devise and an electronics control and compressor. The geothermal pump brings the warm air through the coil and removes the heat and brings back the cooled dehumidified air back into the house. The Geyser Heat Pump Water Heater is a true high quality and highly efficient heat pump water heater and one of the best of any heat pump water heaters in the industry. There are no harmful emissions that can hurt the environment and it works well with any electric, gas and oil application too. What makes this system better than standard water heater is that Energy Star does not acknowledge electric water heaters so they promote other types of technology including the Heat Pump Water Heater. How Much Money Can Be Saved with the Geyser Heat Pump Water Heater? To figure out how much money you can save with the Geyser Heat Pump Water Heater first you will need the number of kilowatt hours that would be best described for example, if the household has 2 people then the average amount of kWh is 3,000, if the family size is 3 then the kWh is 4,500, family size is 4 the kWh is 6,000, the family size is 5 for 7,500 kWh, the family size is 6 then you would use 9,000 kWh and for a family size of 7 the kWh would be 10,500. Then you would need to find the average cost of what the price of kWh of electricity is. You can call your utility company and find out what the average cost is. You may be able to find this information on your utility bills. Now you can multiply the kWh from the family size table and the estimated cost of the kWh. Then take 65% of the number and then you will have a rough estimate of what you can save. You will be surprised at how much that is, compared to what you have already spent. What Are The Benefits of the Geyser Heat Pump Water Heater? By choosing the Geyser Heat Pump Water Heater you can save money almost from the first day over electric resistance water heaters. With energy prices going up and families having trouble making ends meet, you want a system that will save you money. You want to reduce your carbon footprint by purchasing a Geyser Heat Pump Water Heater. Some of the other benefits are that you will have the most savings of energy when the electric resistance heaters are being used when the hot water use is high; the energy savings will kick in. The energy savers are utilized when space cooling or ventilation is present and when homes that require a constant need for air conditioning throughout most of the year too. What Type of Energy Works Best with Geyser Heat Pump Water Heater? 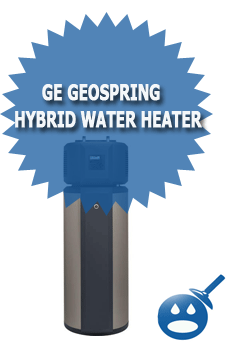 The Geyser Heat Pump Water Heater works well with a Natural Gas or Liquid Propane. It can be used with oil heaters too; it is recommended that you use a licensed installer to ensure proper installation. Often when you use someone not qualified and connections are improper then you could have some problems with installation as well as safety issues too. Geyser uses their own thermocouple and it is adjustable with temperatures ranging from 110 degrees Fahrenheit to 140 degrees Fahrenheit. With so many inefficient water heaters on the market today, wouldn’t you want to choose a water heater that will save you money rather than cost you money. These days when we are all trying to save money on our utilities, looking into a Geyser Heat Pump Water Heater is a great place to start. With more companies going Green, the Geyser Heat Pump Water Heater is a step in the right direction. It is energy efficient and Energy Star rated. You will get hot water in demand and it will not cost you hundreds of dollars every year to run. 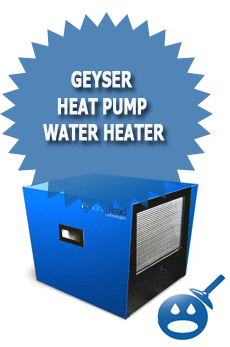 Log onto the Geyser Heat Pump website and get more information, take the first step. I am the distributor for this product in Atlantic Canada . I would like to use your comments on my web site , please let me know if that is possible . UNIT . DESIGNED FOR THE WARMER CLIMATES ,and they expect to release the COLD CLIMATE VERSION in 2010 . I would love to see you comments , or review of those units as well. thank you again and happy holidays . If you like you can add a link to your website linking to this article. Thanks so much for the kinds words and let me know if you need anything else. Just installed mine. Works great. I heated 62 gallons of well water to 120 degrees F and used 3.7 Kw. I should point out that I have a wood stove in my basement and the ambient temperature was probably in the high seventies the whole time. I shut off the circuit breaker to the regular electric water heater. 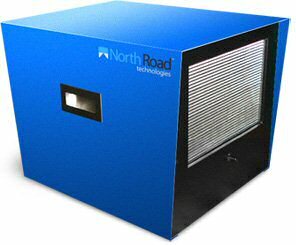 Air cleaner, free distilled water, dehumidification, dirt cheap hot water! all for a thousand bucks—attentitve tech help. I have a etech hp water heater that is very similiar to your equipment. My unit is cutting off on High or Low Head. I have not checked it out yet but I may want to replace it. It is a 6000 Btu unit also. Please provide detailed info including testing, warrant, installation instructions and service info. While it’s rare to have very high levels of VOCs or THMs in your water, most authorities are very concerned. Stay on top as regularly clean help to avoid repairs and more efficient use of filter. Though some environmental organizations see nuclear energy as a solution to the growing climate change, others remain wary.